One of the key ingredients missing from fully immersive virtual reality (VR) experiences is tactile feedback – a physical sensation that matches what you're seeing in the virtual realm. Disney Research, along with MIT and Carnegie Melon University, came up with a clever system that may just solve that problem. 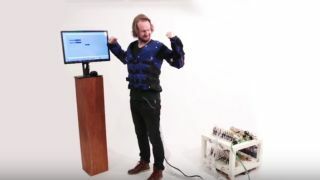 The Force Jacket is essentially a, well, jacket brimming with 26 airbags and 'force sensors' that fill and/or vibrate to give wearers physical feedback across their entire upper body. This is well beyond the haptic feedback provided in controllers for headsets like the HTC Vive, which though giving you some semblance of the sensation of touch, don't extend to the rest of the body. The VR applications for the Force Jacket are apparent. Disney Research's video highlights how the jacket could make you feel like you're growing giant muscles, or that there's a 'friendly' (their words) snake gliding across your body. Vests and jackets that allow you to feel physical sensations that correspond to what you're seeing in VR have been done before, but Disney and Co.'s jacket seems particularly fine-tuned. What's the best VR headset around? Check out our list to find out!